Just five days before the transfer window closes and now less than a week before the start of the Premier League season. 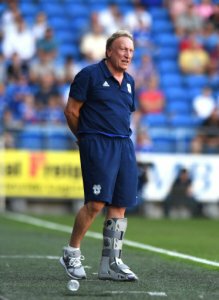 Neil Warnock made four early signings to add to his squad this summer but it's been a barren run of weeks since then as the club has failed so far to add more quality or numbers to the playing staff. Speaking after the defeat at home to Real Betis yesterday Warnock covered a number of topics including the frustration of not having enough players. What did you learn from the game against a side like Real Betis? I think it was a great workout. You've got to be patient and treasure the ball a little bit more. We gave it away in silly areas in the first half but I thought we rectified that in the second. If they had our chances they'd have beaten us by about five but I'm pleased with what we created and we defended well when we had to. What do you learn about individuals in that sort of performance? You're learning all the time, the new players had a good game today. They've all had 90 minutes in the last few days which is important. We played Amiens at St George's Park so today was a carry on from that. We're a couple of players short on the bench but even so I thought it was a really good workout. They're a really good side and that's what we're going to get, especially in the top half of the Premier League. What are you thinking about Bournemouth after the Betis game? We haven't talked yet. We plan about that next week and I'm sure they'll do the same about us. At the moment we're just worrying about getting fit, getting games under our belt and preparing as normal. How is the squad in general going into the Premier League? We've got to enjoy it. We're favourites to finish bottom but that suits us really. I think we can surprise a few people. We need a few more bodies, but I thought there were some pluses today. Big Sol Bamba did well, the forwards looked sharp and Joe Ralls looked sharp with Callum Paterson, so I was pleased and at the back with Sean Morrison and Bruno Manga. I had to start on the bench today! It's been bothering me for a few months but in the end I had to have it done this week. I should be alright next week without a boot. But the players did ever so well today. We're going to get that. We'll have to be patient and I thought it was a great test for us. You've done a lot of early business but now it'll go down to the wire won't it? I'm disappointed that we haven't got one or two but that's life. I won't worry about things like that. Sol will probably end up being the best midfielder in the league. Next week is all about increasing the squad. We've had knock-back after knock-back. I won't sign anybody for the sake of it, I'd rather use the boys I've got in the squad. Josh Murphy looked impressive today. Yes he's improving. We're talking to him all the time. He's more of a team player now. In the past I think he'd have done more individual stuff. Bobby Reid worked hard today aswell. He played in midfield for us because we haven't got anybody else. I thought he did as well as could have been expected. Another week, so we're not far off now. Bournemouth played Real Betis and lost aswell. Is that any kind of barometer? They're a good side aren't they with the players they've got. It shows you what you're up against. Bournemouth are an established Premier League team now, but I think we should look forward to it. I looked at the fixtures and there's not one I'd rather go to than Bournemouth for the first game. Is a central midfielder still a priority following the Marko Grujic update? Yes if I can. If it's not possible then we'll go with what we've got. We're a bit thin with injuries but I've got one or two ideas to supplement the squad. They might not get in the team but I've got to bring in a few bodies in to supplement the squad. Is a striker still on the cards as well? Yes I think so. We didn't play with one today and I thought we did alright. We had two smaller lads and I thought we played quite well doing that. We had a bit more threat and movement so who knows. Are you still pleased the window is closing before the season starts? Yes I think so because we've probably done our business. If we can't get anybody it'll be disappointing, but we're trying to bring the right people in, and that'll go right to the wire I'm sure. And people will be leaving aswell. How important was it to play a side like Betis who dominate the ball? I said on the radio in my preview that it's important to play a side like that when you know you'll be chasing shadows. No disrespect to my lads, but when you've got quality like that, it's so easy to lose concentration. We we very good in that department today, I didn't see them creating much and I thought we had some really good chances. Not really. Aron Gunnarsson didn't play today, he had a bad kick on his knee so I think he's going to have an injection on Monday. Fingers crossed for that but otherwise there's nothing today thank goodness. It's been a really good workout, I couldn't have wished for better really. How has this pre-season compared to previous ones? My pre-seasons are pretty much the same. I enjoy every one. It's the season I don't enjoy!